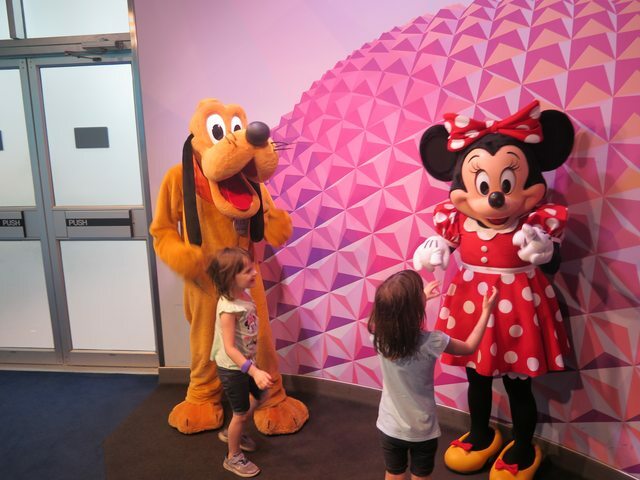 Discussion in 'Disney Trip Reports' started by TheOneWithTheTriplets, Mar 12, 2019. My Citrus Freeze (Florida Cane ‘Orlando Orange’ Vodka, Peach Schnapps, and Mango Puree) was exactly my kind of drink: sweet and fruity. That looks so good! I can't believe I didn't get it in February! As we were getting ready to head out, the characters started rotating through again. We didn’t do a second full set of photos, but we did stop to chat with everyone. We were talking with Chip about how people couldn’t tell him apart from his brother, just like people can’t tell the girls apart. He started miming something I didn’t understand, clearly got frustrated, and pulled out the character book to his page. After skimming his article, he ended up snagging the pen from the bill and writing us a note on a napkin (that’s how seriously he wanted to tell us) that he and Dale were best friends, not brothers. That's so funny - I didn't even know that! Fun fact: I’m not sure which kids are in their photo. I’m pretty sure it’s C on the right, but I can convince myself that A or B could be on the left: Mom of IDs problems. Haha, yeah I can imagine that would be complicated! we encountered Gaston asking people if they had seen Belle. The girls started walking around the area yelling for Belle, but the France pavilion was a bit further than their voices could carry. We quickly hopped into the very short line that had formed and the girls told Gaston that unfortunately, they hadn’t found her. I love all your photos and it is very rare to see Gaston in Epcot, so that was awesome! We really like Garden Grill, the characters here are really good meets, spend much time with you! Enjoying your report! Your girls are adorable! I loved the first visits with each of my girls who were each about the same age as your girls when we took them on their first trips. It is so much fun to see their little faces light up when the see the characters! We haven’t done Garden Grill for lunch or dinner since 2012 or 2013, but your review I making me think we need to again. I really liked it, but we have been doing PPO breakfast there the past couple of trips so that we could get on Soarin right away. 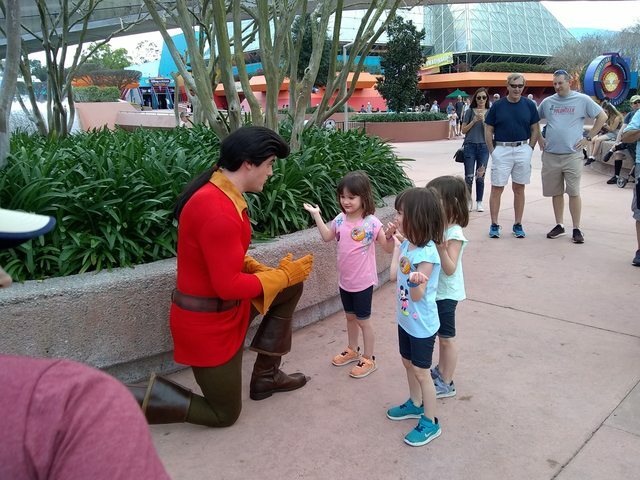 Great that you ran into Gaston in Epcot. We have never met him because my kids haven’t wanted to wait in the long line at MK. You look like you had the best luck with character meets! I love seeing how happy the girls are -- and even happier you were able to have an adult bev at lunch! Sounds like it was a successful Garden Grill meal! I feel like the characters get to come around a little more often at this restaurant as opposed to other places. I've never really thought about Chip and Dale's relationship before. Too funny that you got a personalized note with a...maybe truthful answer. Gaston in Future World? That's a lucky find! I didn't know that was a character training spot; I just assumed they had the one near the IG and that was it. Love that girls tried helping him out by calling for Belle. Following. I can't wait to hear how the rest of your trip turns out! Garden Grill is one of my favorite character meals! Good score on Gaston in training. His lines get so crazy in Magic Kingdom! Garden Grill was one of my favorite meals of our trip too, and I am right there with you on that pot roast - I ate waaay too much of it but it was totally worth it. 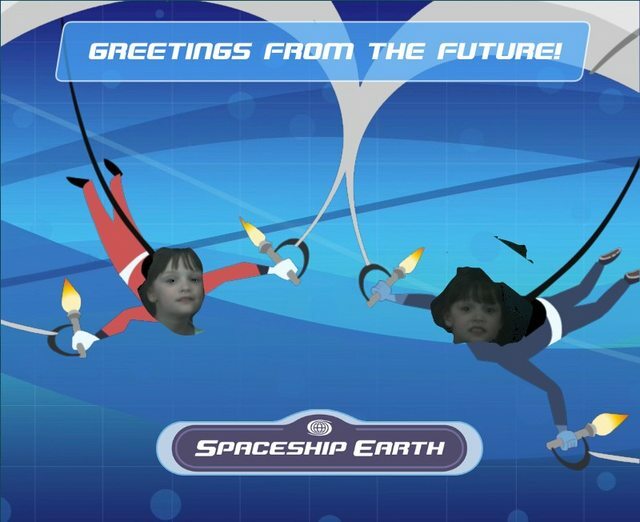 So many cute meets at Epcot! 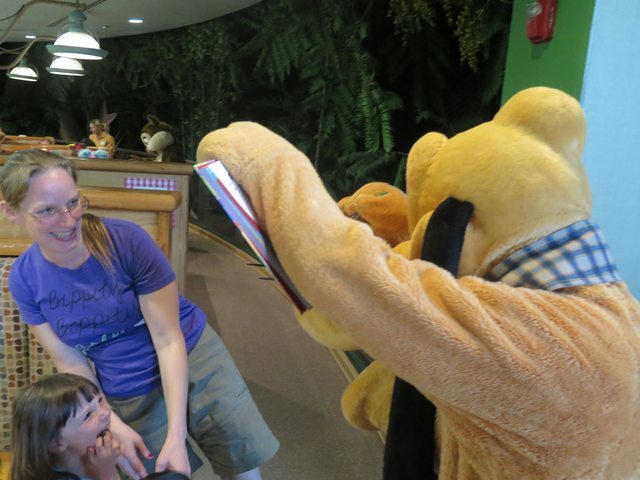 Pluto held the autograph book right up next to his nose which the girls thought was hilarious. When people ask them about meeting characters, Pluto holding the book to his face is a top story they tell. I love how they pick things like this as the most memorable thing. It is always something that you could never plan. I love her face in this pic! We were talking with Chip about how people couldn’t tell him apart from his brother, just like people can’t tell the girls apart. He started miming something I didn’t understand, clearly got frustrated, and pulled out the character book to his page. After skimming his article, he ended up snagging the pen from the bill and writing us a note on a napkin (that’s how seriously he wanted to tell us) that he and Dale were best friends, not brothers. I was thinking this... Was one mad that they didn't get a picture? We quickly hopped into the very short line that had formed and the girls told Gaston that unfortunately, they hadn’t found her. And this pic is great as well!!! Minnie was so surprised by the girls that she counted them and pointed at me to confirm what she was seeing. Yes, Minnie, I find the number of identical children I created to be quite shocking, too. You guys really are show stoppers... Even Minnie is impressed. Just found your TR and joining in! We are headed to the World Memorial Day weekend and your boardwalk ice cream has made it to the top of my list of things to get! DH and I are staying at the BC and I love being able to walk over to the BW! Your first full day sounds like it was a great success. The girls look like they are through the moon with all the Disney magic. I was scared of Pirates as a kid so I completely get their apprehension. Isnt the International Gateway at Epcot the best? It is like your own little VIP entrance. You have really got a lot done in Epcot as well! I am very impressed. 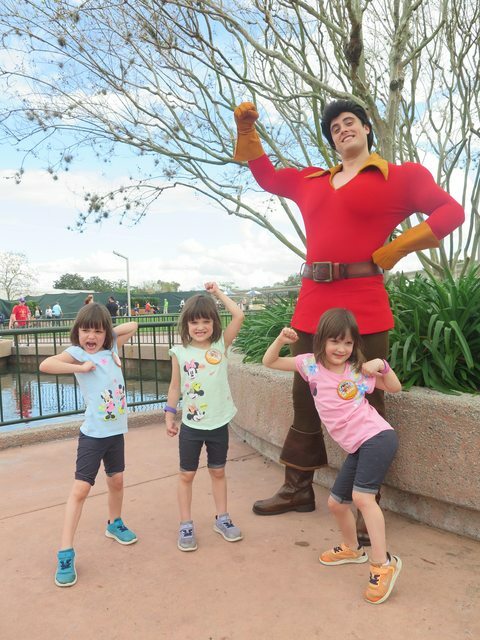 Too bad about missing Gaston's autograph, but it doesnt seem like the girls are too upset.